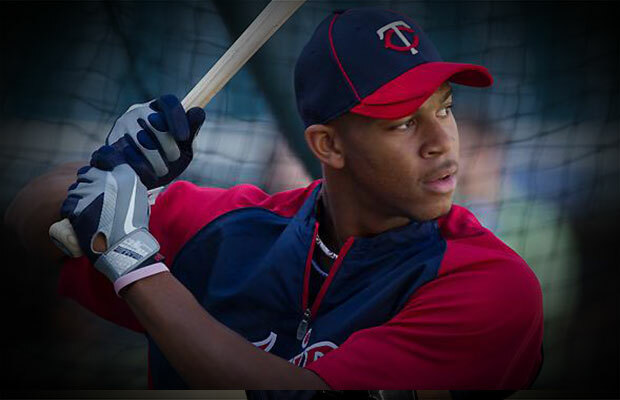 Minnesota Twins Class A outfielder Byron Buxton was named the 2013 Minor League Player of the Year by Baseball America, marking the the second time in the 33-year history of the award that a Twins prospect has been honored. Franchise catcher Joe Mauer was selected in 2003, his third professional season. Buxton spent his first full season in the minor leagues and hit a hit a combined .334 with 19 doubles, 18 triples, 12 home runs, 77 runs batted in, 76 walks and 55 stolen bases in 74 attempts (.743 success rate). He led the minors in triples, finished second with 109 runs scored and was 12th in stolen bases. Other finalists included Twins Double-A third baseman Miguel Sano, Triple-A outfielder George Springer (Houston Astros), Double-A right-hander Archie Bradley (Arizona Diamondbacks), Class A third baseman Joey Gallo (Texas Rangers), Double-A shortstop Javier Baez (Chicago Cubs) and Class A right-hander C.J. Edwards (Cubs). Previous winners of the Minor League Player of the Year award include Wil Myers, Mike Trout, Mauer, Derek Jeter, Manny Ramirez and Frank Thomas.